Here in DC, Jose Andres is one of the district's most beloved residents. Not only are his restaurants excellent and very allergy-friendly (I've reviewed Oyamel, Jaleo, and China Chilcano), but Andres is the founder of World Central Kitchen, a nonprofit organization to empower and strengthen communities around the world with education, training, and social enterprise. Of his many restaurants, Jaleo is definitely a crown jewel, and features an exciting menu of Spanish tapas, paella, and sangria in a colorful and energetic space. 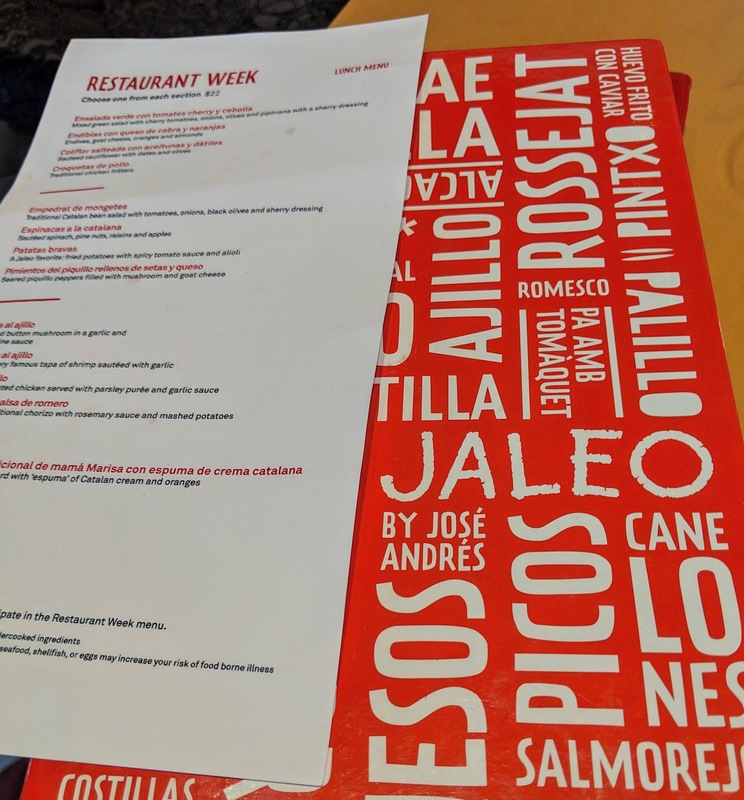 With a recent visit from my mom coinciding with the Restaurant Association of Metropolitan Washington's winter restaurant week, I knew we had to make plans for lunch at Jaleo to seize this unmissable opportunity to sample several courses off the menu. 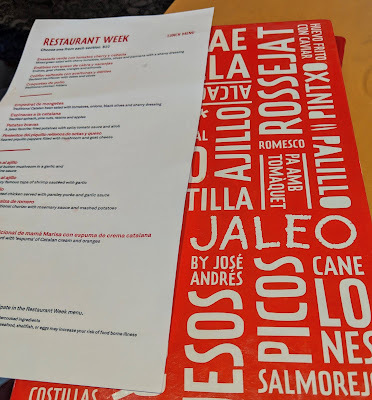 Although I have dined a Jaleo once before (several years ago), this visit would be my first time dining at their flagship location in Penn Quarter so I eagerly anticipated this opportunity for the full experience. 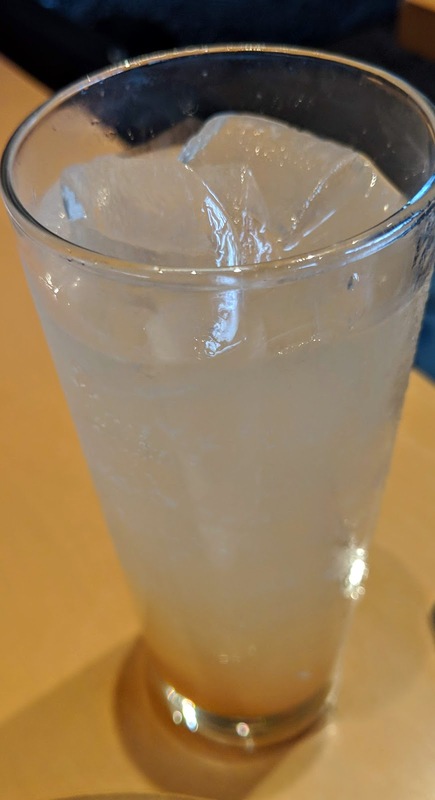 As I was reviewing the special restaurant week prix fixe menu to narrow down my options using Jaleo's detailed allergy menu, I ordered one of their homemade grapefruit-cinnamon soda. It's rare that I ever drink a soda, but I was temped by the seemingly unusual pairing of citrus and cinnamon. I was one over in my first sip however. The tangy-sweet soda wasn't overly sweet, and was clearly made with real grapefruit juice. The cinnamon added a pop of spice that reminded me of my favorite beverage from the Wizarding World of Harry Potter at Universal Orlando. Starting off my feast, I ordered the coliflor salteada con aceitunas y dátiles (cauliflower with dates and olives). The florets has a sweetness to them, which was accented by a generous sprinkling of paprika. The dates added another accent of sweetness to while the olives brought a salty flavor in contrast to the other components of the dish. For the next course, I selected empedrat de mongetes, or a traditional Catalan bean salad. Exquisitely arranged and prepared with care, this showstopping salad may be sized as a starter but deserves a spotlight all it's own. White beans, tomatoes, green onion, olives, and sprouts were perfectly portioned and flavorful, brought together by a lovely sherry dressing. 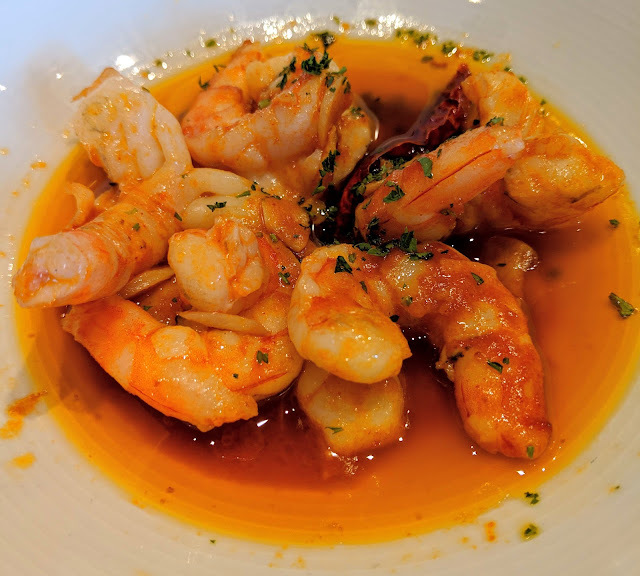 As a the final savory tapas, I ordered the gambas al ajillo, Jaleo's famous tapa of shrimp sautéed with garlic. Don't let the simplicity of the presentation fool you, this dish features an explosive garlic flavor, which definitely scored points with me as a garlic-loving foodie. The plump, fresh shrimp were bathed in the garlic-infused oil, with heat-packing peppers providing extra flavor and flair. As the cherry on top of this feast, pun definitely intended, the final tapas of the lunch was a cherry sorbet (the only gluten and diary-free option). 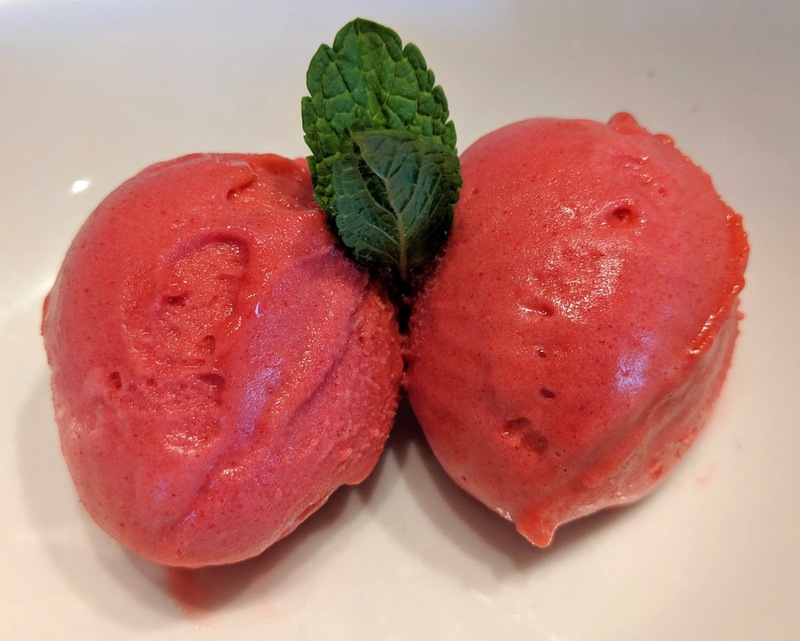 With an intense cherry flavor, the sorbet was rich and almost creamy in its texture. The portioning was perfect as a finale for the lunch, as it was just enough to satisfy but not overwhelm with sweetness. I entered this dining experience with sky-high expectations, and I'm happy to report that Jaleo didn't let me down at all. Every part of my meal was clearly crafted with intention, but the second and third courses definitely stood above the first, and are the two I would order again at a future experience. 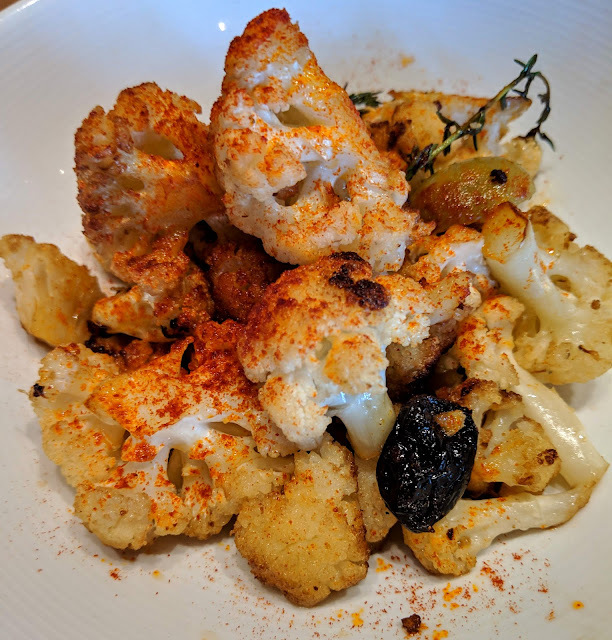 If you are looking for a restaurant for a special meal in or around the area, Jaleo is a prime pick, as they have a clear and expansive allergy menu and the expertise to accommodate dietary restrictions without compromising any bit of the culinary creativity they are known for. 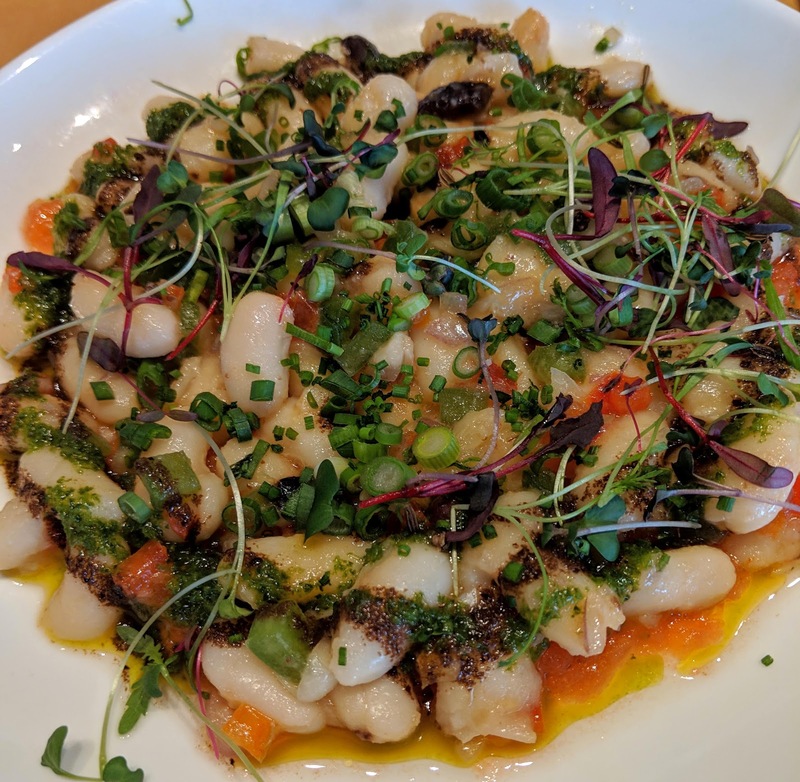 Look out for Metropolitan Washington Restaurant Week to return this summer, where you can grab lunch or dinner and sample around the menu at an affordable fixed cost.